Navigating the urban jungle that is the Docklands area of London is always an interesting experience… surrounded by the huge glass cathedrals of trade and commerce and yet finding constant reminders of the areas heritage, a bustling and world’s largest trading post, with ships from around the globe gathering to trade goods and ideas. Docklands has an interesting collection of churches worth exploring, built by workers and company owners, and reflecting a range of architectural styles. However, right at the heart of the area, between Canary Wharf and West India Quay is a unique and yet perfectly formed church, one which both reflects the heritage of the area and provides services to its current and future communities. St Peter’s Barge is London’s only floating church and hosts a wide range of activities and events. It’s also well worth a visit to see the very calm and light space that has been created aboard, amongst the hustle and bustle of the area. The National Churches Trust’s 60th anniversary has been celebrated at a special service held at Westminster Abbey on Thursday 28th November 2013. The actress Geraldine James OBE read ‘Please Close this Door Quietly’ a poem specially written for the service by former Archbishop of Canterbury Dr Rowan Williams. Television presenter and Chief Scout Bear Grylls and historian and broadcaster Bettany Hughes read passages from the scriptures. The broadcaster and journalist Huw Edwards, who is also a Vice-President of the National Churches Trust, presented the stories of three churches which have been supported by the charity. These featured interviews with representatives from St Mary de Castro, Leicester, Memorial Community Church, Plaistow and St David’s Church, Llanddewi Aberarth. Six banners illustrating the work of the National Churches Trust were processed through Westminster Abbey at the start of the service by bearers who included children from St-Martin-in-the-Fields High School, Tulse Hill, in south London. • HRH The Duke of Gloucester KG GCVO, accompanied by HRH The Duchess of Gloucester GCVO. • Sir Thomas Allen CBE; Huw Edwards; Bear Grylls; Bettany Hughes; Gloria Hunniford; Geraldine James OBE; Rony Robinson; Alastair Sooke; Rt Hon Admiral Lord West of Spithead GCB DSC. • Lord Alton of Liverpool; Lord Best OBE; Rt Hon Lord Brooke of Sutton Mandeville CH; Baroness Butler-Sloss GBE; Rt Hon Lord Cormack DL FSA; Baroness Fookes DBE; Rt Hon Lord Glenarthur DL; Lord Hennessy of Nympsfield FBA; Rt Hon Lord Howe of Aberavon CH QC; Rt Hon Baroness Linklater of Butterstone; Rt Hon Baroness Rawlings; Lord Rowe-Beddoe DL; Rt Hon Lord Shaw of Northstead DL; Baroness Wheeler MBE. • Dame Liz Forgan DBE; Prince Rupert von Preussen; Sir and Lady Sainsbury. • The Rt Hon Dominic Grieve MP (Attorney General); David Amess MP; Rt Hon Sir Tony Baldry MP (Second Church Estates Commissioner); Rt Hon Sir Alan Beith MP (also Chairman of the Historic Chapels Trust); Nicholas Boles MP; Angie Bray MP; Rt Hon Jeffrey Donaldson MP; Helen Goodman MP (Shadow Minister for Culture, Media and Sport); Rt Hon Simon Hughes MP; Andrew Rosindell MP; Barry Sheerman MP; Rt Hon Caroline Spelman MP; Martin Vickers MP. • Most Revd and Rt Hon The Archbishop of Canterbury, Justin Welby; Rt Rev Nicholas Holtam, Bishop of Salisbury; Most Revd George Stack, Roman Catholic Archbishop of Cardiff; Revd Lord Griffiths of Burry Port, former President of the Methodist Conference. • Rt Revd Ian Brackley, Bishop of Dorking; Very Revd Nigel Godfrey, Dean of St German’s Cathedral, Isle of Man; Rt Revd Kenneth Good, Bishop of Derry and Raphoe; Rt Revd Jonathan Goodall, Bishop of Ebbsflett. • His Eminence Abba Seraphim El-Suriani – Metropolitan Seraphim of Glastonbury, British Orthodox Church; Very Revd Archpriest Gregory Hallam – Antiochan Orthodox Deanery of the United Kingdom and Ireland; James Laing – General Secretary, Council of Lutheran Churches; Revd Graeme Longmuir – Moderator, Prebsytery of Gordon; Derek McAuley – Chief Officer, The General Assembly of Unitarian and Free Christian Churches; Emmanuel Mbakwe – National Leader, Apostolic Church UK; Hugh MacKenzie – Moderator of Presbytery, Associated Presbyterian Churches; Ray Ursell – President, Independent Methodist Churches; Ernie Whalley, President of the Baptist Union. • Sue Bowers, Chair, Heritage Lottery Fund London Committee; Clementine Cecil, Director, SAVE; Catherine Croft, Director, Twentieth Century Society; Sara Crofts, Deputy Director, Society for the Protection of Ancient Buildings; Diana Evans, Head of Places of Worship Advice, English Heritage; Dame Helen Ghosh DCB, Director-General, The National Trust; Janet Gough, Director, Church of England Cathedrals and Church Buildings Division; ; Kate Pugh, Chief Executive, Heritage Alliance; Anne Sloman OBE, Chair of the Church Buildings Council; Neil Sumner, Vice Chairman, Welsh Religious Buildings Trust; Crispin Truman, Chief Executive, Churches Conservation Trust; Nick Way, Director General, Historic Houses Association; Dr Manon Williams LVO, Chair, Heritage Lottery Fund Wales. Next week at a service at Westminster Abbey to mark our 60th anniversary, to be held on Thursday 28 November, actress Geraldine James will read a poem about churches specially written for the occasions by Dr Rowan Williams. We will make the poem, titled ‘Please Close This Door Quietly’ available on the day of the service. But in the meantime, we’d like to hear from you about your favourite church poems. Many poets and writers have been inspired by the architecture and spirituality of church buildings and church yards, and we below include some favourites by Larkin, Betjeman, Thomas Gray and Simon Armitage. 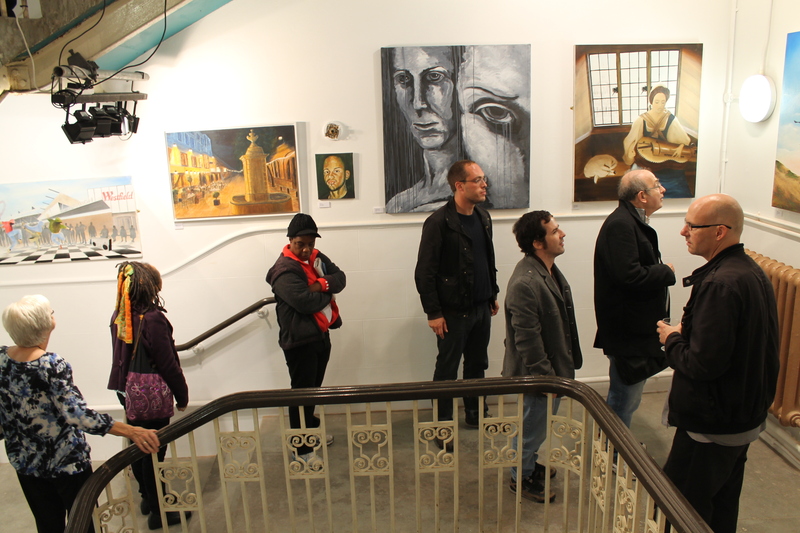 The Tower Gallery in Plaistow officially opened its first exhibition, Art Arising, on Thursday evening 3 October. Nearly 100 people attended the opening, including Councillors Brian Collier, Marie Collier and Kay Scoresby. Created in the east tower of the historic Plaistow Memorial Church building, the gallery is a partnership between Memorial Community Church and Rosetta Art Centre, which has curated this inaugural exhibition of 63 works by 16 local Newham artists. The project is supported by grants from Community First Canning Town North and Let’s Get the Party Started. Plaistow Memorial Church has received funding from the National Churches Trust over the last two years to help fund major repairs and improvements, including improving access and repairing crumbling brickwork. The exhibition is free and is open until 20 December from 11 am – 2 pm on Tuesdays-Fridays, 1 -3 pm on Saturdays and on the first Thursday of each month from 6-9 pm. The gallery makes use of the tower stairwell to display the artwork rising up to four floors, which means there is no step-free access. However a video tour was shown at the opening event and will be available to view by arrangement. Tower Gallery is located at Memorial Community Church, 395 Barking Road, Plaistow E13 8AL. The exhibiting artists are: Anne Brown, Antonietta Torsiello, Daksha Amin, David Ross, Dimitrios Oikonomou, Frank Jennings, Karen Colley, Klaus Pinter, Mairi Bugg, Michael John Wills, Parvin Khoshdel, Rayna Nadeem, Ricardo di Ceglia, Ricky Aitchinson, Steve Marriott, Tim Timewell. In a guest post, artist Timothy Betjeman writes about his new paintings of All Saints Church, Margaret Street in London’ s West End. I was born and lived most of my life in America, so I have come to know England, and especially London, where I now live, through painting parts of it over the last seven years. 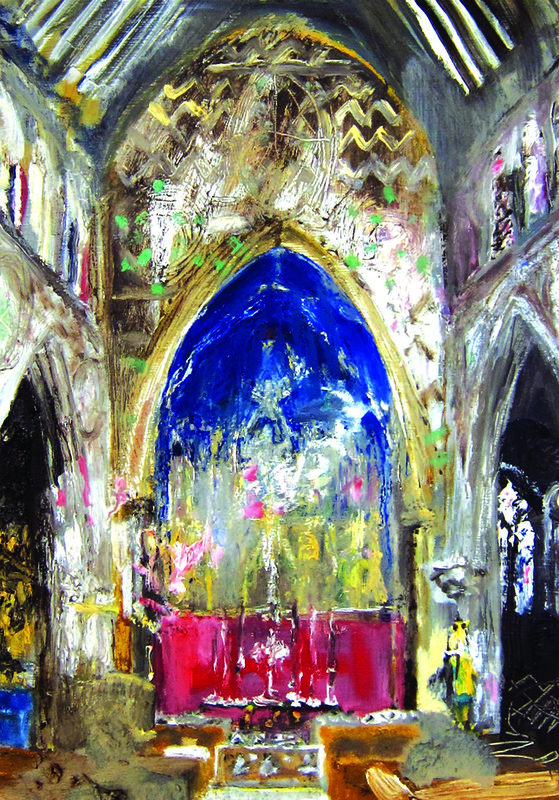 It is a frequent occurrence for me, as a primarily ‘plein air’ painter, to be working in a place that has caught my interest for whatever reason, and to discover that its history at some point entwined with that of my grandfather, Sir John Betjeman, especially if the place happens to be a church. All Saints , Margaret Street was no exception. When I began painting at All Saints, I was quickly informed by a parishioner who took note of my surname that he had enthused about the church in a series on Victorian Architecture for the BBC in 1970. I somewhat wished I’d discovered it myself—and it really does feel like a discovery, hidden like a treasure between tall buildings, invisible save for its spire until one is practically in its courtyard. But my jealousy soon gave way to a comforting thought, that this building, designed for a purpose by William Butterfield in 1850, and still used for that purpose today, could attract our mutual admiration. I was very young when my grandfather died, so I never really knew him. When I come upon buildings like All Saints, that I know he touched, or was touched by, and if I feel the same thing, there is a sense of knowing him through that. I think that my engagement with these places develops in a different way than it did for him, but the initial attraction to great architecture and the atmosphere it affords is a major source for me as an artist as it was for him. 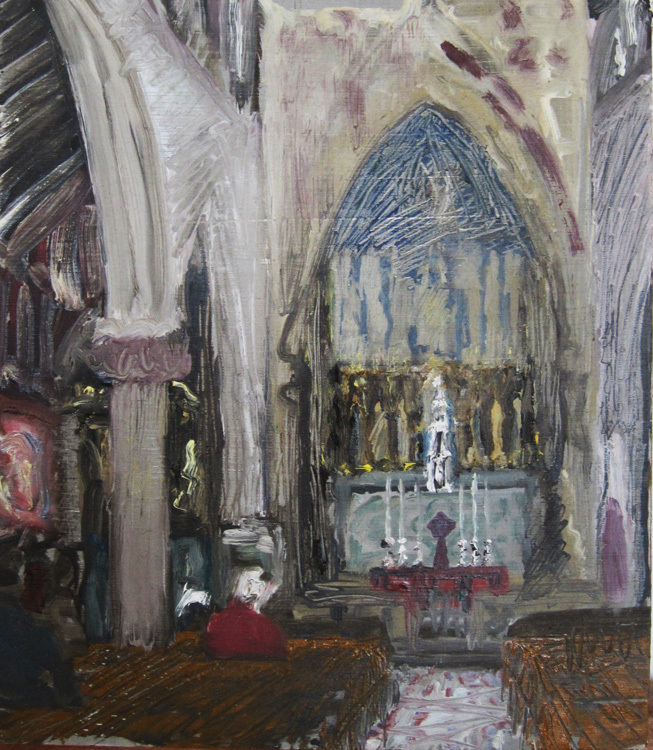 My introduction to All Saints Margaret Street was in 2012 by my friend Alistair Fletcher who brought me to a service there, promising it had a very good choir (it did), and urged me to do a painting of its eccentric interior. After the service I spoke to the vicar, Alan Moses, and he was enthusiastic about the idea, so I started showing up 3 or 4 times a week. I would set up my easel in the morning near the back of the church and work through the 1:10 Mass, and pack up when the electric lights came on just before Evening Prayer. I liked the ritual of working in the church so much that I ended up doing ten paintings instead of one, and a series of etchings as well; so I spoke to the vicar again at the end of it all, and we decided to do a show. I’m accustomed to painting on the street, where people are moving about me very quickly and their movement must be integrated with the relative stillness of the architectural forms. Painting at All Saints was unique in that the dynamic was reversed. The people (and usually there were one or two, even between Masses) stayed perfectly still while the wild zigzags and gilded decoration on the walls and floor seemed to turn on and off and shift with the light as it came in sudden streaks through the high chancel windows. I spent a long time studying the way natural light came in and competed with the invented light of the designs covering the inside of the church. There was a kind of weather system to the place that related to but was wholly different from the one outside. One feels this as soon as one enters the dark quiet of the church and inhales. In the course of the 6 months or so that I spent painting at All Saints, and the time I have spent there since, I am very thankful for how kindly I was received by the priests, wardens and all of the parishioners. It is a rare place, and truly a living church.